A custom property is a set of values located on the horizon. They can be the result of horizon operations (read Horizon Operations in Map View), or the result of on-the-fly map view amplitude extractions. Use custom properties to store results that take a long time to calculate, or for inputs to other operations (volume math, contouring, etc). Tip: Horizon properties are listed in the Properties drop-down in alphanumeric order. To arrange your custom properties such that they display in a certain order, assign a prefix to their name (e.g. 1, 2, 3). 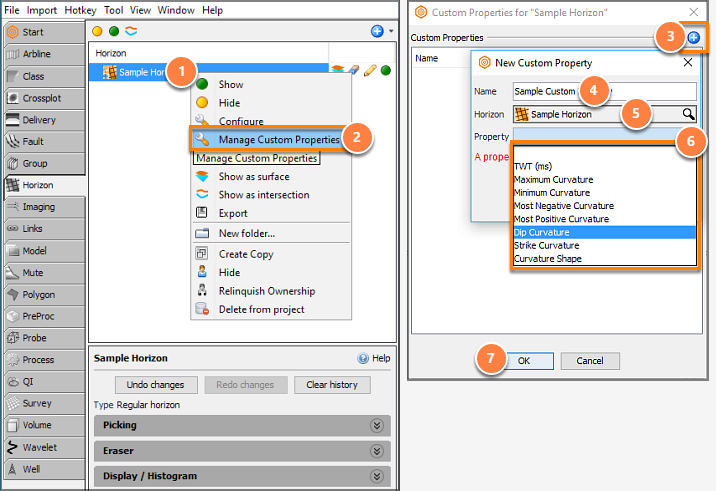 Custom properties can be copied, renamed and deleted. Open the Horizon tab in the Control Panel. Click Manage Custom Properties. This will open the "Custom Properties for..." window. Click the blue "+" to copy properties, see Create from another property. 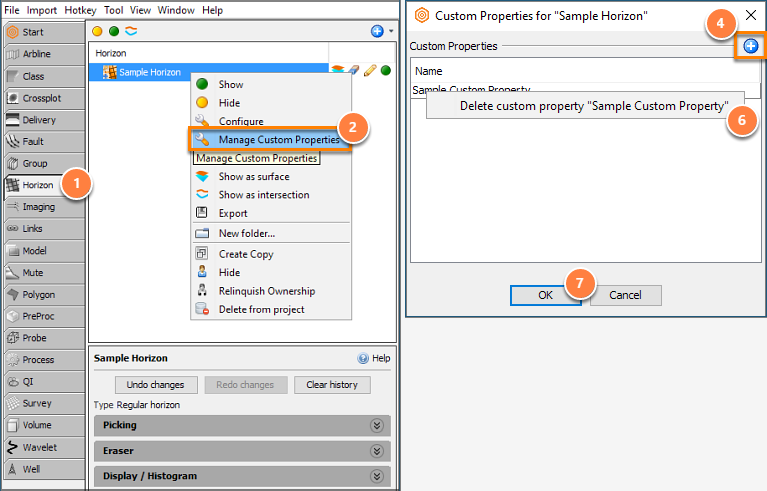 right-click the custom property and choose "Delete custom property..."
A custom property can be duplicated, or copied between horizons. In the Horizon tab, right click on the destination horizon. In the window, click on the blue "+" icon. Select the horizon to copy from (default is the current). Select the property to copy. Click OK. The new property will be added to the list of properties for that horizon. 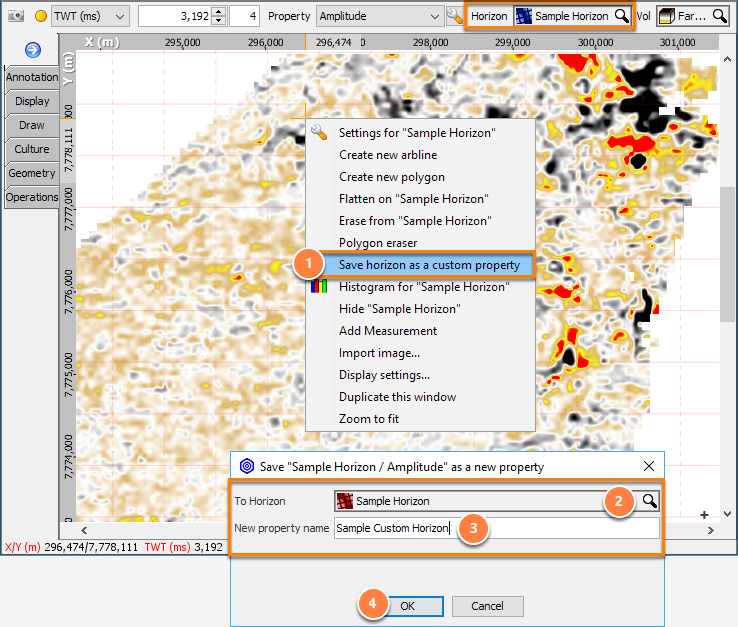 Horizon properties displayed in the map view can be saved as custom property, e.g. to save a single-horizon amplitude extractions (see Horizon Display and Amplitude Extraction). In the Map View or 3D View, right click on the map and select Save horizon as a custom property. The "Save... as a new property" window will appear. Select the horizon in which to store the property. Enter a name for the property. Click OK. The property will be added to that selected horizon. Click Add property. The Add result to horizon window will appear. Select the horizon in which to store the new property. Click OK. The property will be added to the selected horizon.